Head over to Redbox on Facebook, “like” them and then click on the America’s Movie Night tab. You’ll get a FREE code for one night’s rental on August 25th. Get a FREE one night DVD rental from Redbox when you use the promo code MEJER86 at Meijer locations. Check in with Four Square tomorrow (Monday) at any Redbox at a Walgreens location and you’ll get a FREE Redbox code good for one rental that night. Get a FREE one night rental from Redbox when you buy any two 2-liter Pepsi products and any one bag of Lay’s, Tostitos, Rold Gold, or Sunchips Snacks 9 oz. or larger in a single transaction at Walgreens now through 5/21/11. 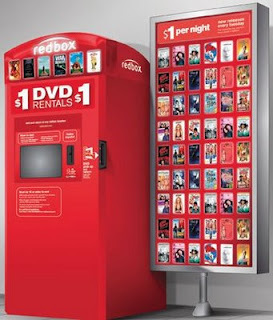 Groupon Deal: 3 Redbox Rentals for $1.00! Groupon has a great Redbox deal today – pay only $1.00 for 3 Redbox rentals. Select Nashville, TN (once on Nashville, look at the top of the page – the deal will be inside the yellow box) – you might be able to see this deal on any city page! This deal is not valid on Blu-ray or video games. Groupon is a daily deal site that sells groupons (deals) at really reduced prices. Deals are usually only available for one day. Redbox has a FREE rental code on their Facebook page. Once you Like the Redbox page on Facebook, click on the Freebie tab and follow the instructions to see your FREE* one-night DVD rental code. The code will only be good on February 24th. Already like redbox on Facebook? Go get your code! When you “like” Redbox on Facebook, you will receive a FREE promo code for one night’s rental on June 21st – That’s tonight! When you “like” Redbox on Facebook, you will receive a FREE promo code for one night’s rental on June 21st. It must be the day of free DVD rentals! Rent two movies at the same time at any Redbox and you will be e-mailed a code for one free rental. This offer runs through June 30th. The code is valid for 7 days from when you receive the e-mail. Go here for more information.